WINSTON-SALEM, N.C. – In honor of National Chicken Wing Day on July 29, East Coast Wings & Grill will be awarding guests nationwide with a voucher valid for five free chicken wings on their next visit. Proclaimed in Buffalo, New York in 1977 as a day to honor the original recipe of combining hot-sauce and butter to create buffalo sauce, the entire country has since taken note of this enthralling recipe, spawning a love affair between Americans, buffalo sauce and chicken wings nationwide. Guests are encouraged to visit East Coast Wings & Grill on this momentous occasion to join fellow chicken wing fanatics indulge in and celebrate the beloved chicken wing. The North-Carolina based casual family dining franchise offers dozens of flavors that can be paired with nine heat intensities, creating hundreds of delicious sauce options catering to everyone’s taste buds. Known for its wide variety of buffalo wings, East Coast Wings & Grill offers nationally award-winning wing sauces that are mixed to order with the freshest ingredients. Inspired by different cultures—The Islands, Tex Mex, Classic American, Asian, Southern BBQ, European, Bayou and more—at East Coast Wings & Grill, community members can enjoy dozens of flavors of chicken wings and choose from nine heat intensities, resulting in hundreds of possible combinations that can be added to most entrees and of course, wings. While wings remain a staple, the restaurant’s six-page menu includes burgers, salads, sandwiches and more. For more information on East Coast Wings & Grill or to find the nearest location, visit www.eastcoastwings.com. East Coast Wings & Grill is a fast-growing, casual, family dining franchise that puts the spotlight on buffalo wings. With more than 70 locations nationwide currently operating or in various stages of development, the burgeoning franchise recently secured itself a top spot for the second consecutive year on Restaurant Business Magazine’s “Future 50” list of the fastest-growing U.S. mid-size restaurant chains. Entrepreneur magazine also named East Coast Wings & Grill one of the nation’s top franchise investments, and Franchise Times magazine ranked the company No. 395 on its “Top 200+” list of top revenue-producing U.S. franchises. The concept has also been recognized by The Franchise Grade and Franchise Business Review for transparency during the franchise sales process, franchisee support and overall franchisee satisfaction. 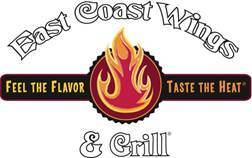 For more information about East Coast Wings & Grill or its franchise opportunities, visit www.eastcoastwings.com or www.eastcoastwingsfranchise.com."